Goods will be well protected. Condition Used. SL98 Insulfrog right hand curved point. This is a pair of 00 scale Peco points as shown in the photos. Both are in good working condition. They have been fitted with ZTC 302 point motors which have a built-in DCC decoder. Peco Point OO Scale. 14.5 cms in length (not including joiners). have never been used. Peco SL-97 Small Y Point Insulfrog. Point In good condition could do with a clean. We are enthusiasts and modelers who have successfully turned our hobby into our livelihood. Code 100 Insulfrog. Peco Streamline SL-97. Small Radius Y Point. NEW PECO ST 238 CURVED LARGE RADIUS FOR USE WITH Y POINTS + OTHER SITUATIONS. PECO ST 238. FOR USE WITH Y POINTS ST 247 AND OTHER SITUATIONS. 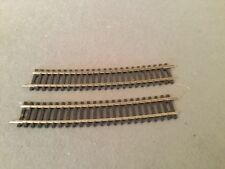 PECO STREAMLINE SMALL RADIUS Y POINT `00` GAUGE CODE 100 RAIL INSULFROG SL-97. Scale / Type: OO Scale. We will always help you to have a 100% positive happy buying experience. Our Code: PEST-247. Part Number: ST-247. Add to favourites. Equivilent to Hornby R8076 Y point. Code 100 Insulfrog. Peco Streamline SL-98. Large Radius Y Point. Peco Code PL-26 Yellow. New and unused. Insulfrog Large Radius Y Turnout. Nominal radius:1828mm, Angle:12 degrees, Length: 220mm. We will always help you to have a 100% positive happy buying experience. Our Code: PESL-98. Part Number: SL-98. Code 100 Electrofrog. Peco Streamline SL-E97. Small Radius Y Point. In good condition - barely used from new. No box - will be well packed for shipping. Insulfrog Small Radius Y Turnout. Nominal radius:610mm, Angle:24 degrees, Length:148mm. We will always help you to have a 100% positive happy buying experience. Our Code: PESL-97. Part Number: SL-97. Small Radius Y Turnout. Nominal radius: 610mm, Angle: 24 degrees, Length: 147.4mm. We will always help you to have a 100% positive happy buying experience. Our Code: PESL-E197. Part Number: SL-E197. Add to Favourites. This item is New and Unused. Add to Favourites. Catalogue number ST-238. Code 75 finescale electrofrog. Large Radius Y Turnout. Electrofrog Large Radius Y Turnout. Nominal radius:1828mm, Angle:12 degrees, Length: 220mm. Code 100 Electrofrog. PECO PESL-E98. Easily accessible from the main A55 with free parking outside. Code 100 Electrofrog. Peco Streamline SL-E98. Large Radius Y Point. 2 of these turnouts can be combined with a short crossing (SL-193/SL-E193) to make a compact double junction (Overall length 275mm). Code 75 finescale electrofrog. Y Small radius. Small Radius Y Turnout. Large Radius Y Turnout. Nominal radius: 1829mm, Angle: 12 degress, Length: 220mm. We will always help you to have a 100% positive happy buying experience. Our Code: PESL-E198. Part Number: SL-E198. Code 75 Electrofrog Large Y Point. PECO SL-E198. 1:76 00 SCALE. Be sure to add us to your favourites list ! WORKING ORDER: Yes. Get In Touch. PECO SL-98. LARGE RADIUS. MORE WILL BE ADDED WHEN OUR RANGE INCREASES. Used model railways & collections always wanted. How it started; I have been interested in model trains since I was a child. It was more fun and much cheaper, now I can fix most locos so they run like new. SL-E197 Peco Y Point / Turnout Small Radius Electrofrog code 75 rail 00/H0. Used model railways & collections always wanted. HS1-9, IV41-53, 55-56, KA27-28, KW15-17, PA20, 41-49, 60-78, PH42-44, ZE1-3 (48-120 Hours subject to ferry schedules and weather) Up to 20 kilos £25.99. CODE 100 INSULFROG. PECO OO GAUGE. SL-E198 Peco Y Point / Turnout Large Radius Electrofrog code 75 rail 00/H0. Used model railways & collections always wanted. HS1-9, IV41-53, 55-56, KA27-28, KW15-17, PA20, 41-49, 60-78, PH42-44, ZE1-3 (48-120 Hours subject to ferry schedules and weather) Up to 20 kilos £25.99. SL-97 Peco Y Point / Turnout Small Radius Insulfrog code 100 rail 00/H0. Used model railways & collections always wanted. HS1-9, IV41-53, 55-56, KA27-28, KW15-17, PA20, 41-49, 60-78, PH42-44, ZE1-3 (48-120 Hours subject to ferry schedules and weather) Up to 20 kilos £25.99.